Can you hear the haunting sound of the bugle? Yep, this is the end of the road and I’m posting this from Teddington where the sun is shining and the living is easy. The last leg of the journey and another adventure! Those adventures, they pop up when you least expect them! Having found a ferry company that takes foot passengers, the next challenge was to get from Calais Ville to Calais Port. No easy task. But, as anyone reading this blog will know by now, easy is what we try, diligently, doggedly and often successfully, to avoid! Researching deep into the night to find a local bus service that must surely exist (“How do the people who work in the port get to work if not by bus?” Lizzie asks with the innocence of years) yielded little we could count on. The Calais Guide hinted at a P&O shuttle service that a P&O customer services person assured me, when I phoned to check, they knew nothing about. Harrumph! Finally found a promising website with proper timetables – last revised 2011-12……. More harrumph! Such were the demands of this nocturnal research that we overslept on the morning of departure, a very unusual occurrence for us as himself is always up early and eager to seize the new day. Oversleeping – excellent way to narrow down the options, so a taxi to the terminal and into a series of corridors and holding bays that made us feel we might be living out a Kafka story. Checked here and processed there, we boarded, sailed and docked in Blighty. Disembarking with the half dozen or so other foot passengers, we encountered Eddy from Essex (real name withheld for reasons of confidentiality), a mountain of a man, 20 stone at least in the buff. But thankfully he wasn’t, being clad in a pair of baggy shorts, white socks, red sneakers and T-shirt from the latest Eagles Tour. He wheeled the tiniest suitcase behind him, so tiny I’m not sure he would have squeezed a spare pair of boxers and a toothbrush into it. Eddy is a cartoonist’s dream, a sight to raise a chuckle. A thoughtful, serious man hides behind the comical exterior and in the space of about 20 minutes while we walked from the ferry and were bussed to the Dover terminal, we had a discussion about the wonders of DNA testing, about man and his brief span of time on the planet, and Eagles tours he has seen! Another character to add to the cast. The 1225 from Dover Priory to Waterloo East. Takes nearly two hours – travelling almost as slowly as Sofia to Belgrade but in a lot more comfort. Whip across to Waterloo mainline Platform 4 for the 1427 to Strawberry Hill, ease Oysterwise through the barriers, the familiar smell of SW Trains and those unchanging announcements. The stuff of homecoming. Fab! 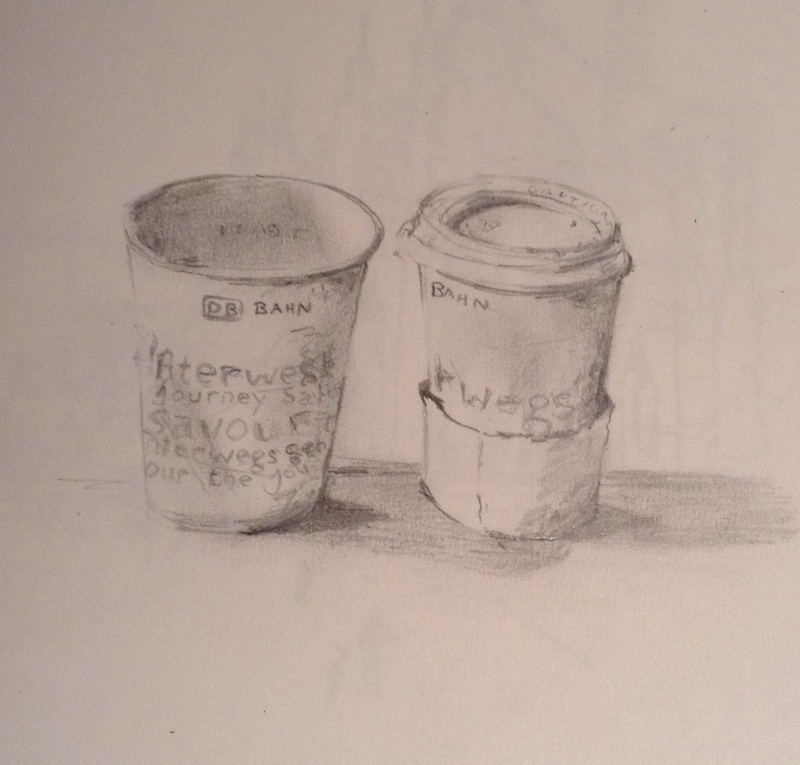 A final sketch from Jim below – a regular sight on our train journeys, two paper cups. Ever the search for a decent coffee! Thanks for reading! Till the next time. Wonderful, Lizzie, enjoyed every post and so glad you made it back safe and sound! Know what you mean about being tired after all this adventurous travel. You’ll be sleeping in for weeks now. See you in a few weeks…coffee is on us! What an incredible odyssey! Thank you for sharing it with witty and entertaining insights, observations, and wonderful sketches. We’ve enjoyed every vicarious step of the way (from the comfort of our sofas). Hats off to you both for achieving the goal. We are just back from Mallorca and catching up on our emails etc. we didn’t have Internet so missed all your blogs. However have now been able to sit and read them all in one fell swoop. Most enjoyable but so glad it was you not me/us suffering those long night journeys. Once Tom and I took an overnight sleeper from Budapest to Prague, thinking it would be a romantic experience. Anything but. It was like a scene out of a Nazi war film with angry guards and even angrier Alsatian dogs entering our couchette compartment at 2 in the morning, putting glaring overhead lights on and demanding to see our passports. And that was just at the border between the Czech Republic and Slovakia which had been the same country a short while before! Anyway that was only one night…never again will I be tempted….you are obviously gluttons for punishment. Seriously though, it was a great that you did the blog and the drawings were an added bonus, so much better than photos! Lizzie I have just re-read this and I really think it needs to reach a wider audience. Your words and Jim’s illustrations make this a work of art.